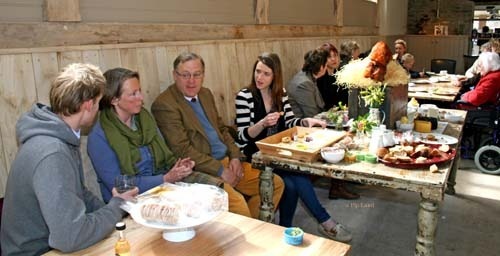 Above: Bridget and Adrian Thornton-Berry enjoying a tea break after the official opening of Berry’s Farm Shop and Cafe by William Hague MP on Saturday, April 14. Woodland and meadow walks and the chance to see llamas, kune kune pigs and the fluffiest chickens you can imagine (Buff Orpingtons) are all on the “menu” at Berry’s Farm Shop and Cafe at Swinithwaite in Wensleydale. Bridget Thornton-Berry and her family have created an environmentally friendly place to gather and enjoy a meal behind Swinithwaite Hall. The walks include a newly opened one through unimproved pasture full of native wild flowers to Redmire waterfalls. Dogs on leads are welcome on those walks. Hopefully there will be plenty of warm, dry weather this summer so that the lovely courtyard beside the café can be enjoyed as well. Light snacks will be served from 9.30am to 5.30pm Monday to Saturday. For Sunday lunches it will be open from 10am to 4pm. To contact the shop and cafe phone 01969 663377. The chairs and much of the new buildings have been made from timber from the Swinithwaite Estate and a wood burning boiler provides the heating and hot water. All the water comes from the roofs of the buildings. This same sustainable approach applies to the café and the shop with the vegetables, cheeses, oils, chocolates and preserves being procured from local producers by Nick and Sue White’s WKD Rural Business Consultancy. The on-site butcher selects beef, lamb and game from the Swinithwaite Estate and quality meat from a 30 mile radius. Other old farm buildings at the hall have been developed to retain their traditional features and to provide modern facilities for such businesses as a laundry and a bakery.